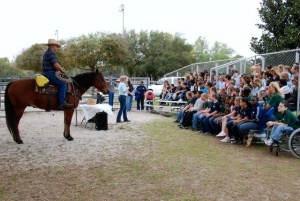 Polk County Farm Bureau partners with UF/IFAS Extension and the Polk County School Board to hold this annual event which educates present and future consumers on the importance of agriculture. The event is sponsored by The Mosaic Company and the Florida’s Natural Growers Foundation. The 2015 event was held at the UF/IFAS Polk County Extension office in Bartow. Each year, more than 300 teachers and 6,000 Polk County fourth graders learn about the area’s major agriculture commodities. Agri-Fest gives young students the chance to learn about agriculture through hands on experiences.